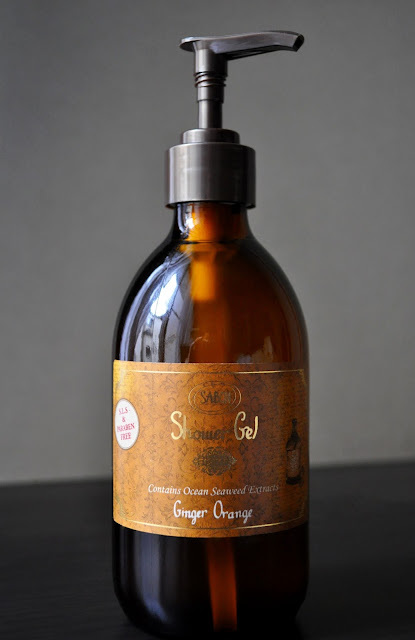 I popped into Sabon to pick up the Shower Oil in Ginger Orange; however, I was seduced by the dark brown-amber-colored glass bottle of the shower gels, and got the Ginger Orange scent in that line instead. As per the website, the shower gels are a "gel-based liquid soap enriched with ocean seaweed extract to nourish and revitalize the skin." Seaweed is rich in vitamins and minerals, and a fantastic agent in skincare with it's vast range of benefits. I've never tried Sabon's Shower Gels, so, I was eager to see how it would compare to the shower oils I love dearly. I've used the shower gel twice, and found it had a rich, velvety lather, and left my skin feeling soft and clean. Even though my skin doesn't feel the least bit dry or tight, I will say I find the shower oils more moisturizing. Of the Sabon fragrances I've tried, Ginger Orange has more of a clean, masculine cologne scent (the fragrance is familiar to a men's cologne, but I just can't put my finger on the name), and the ginger gives it a delicious spicy twist. I enjoy the balance of rich and fresh scents without being overpowering, absolutely lovely for the beginning of Fall. Sabon Shower Gels retail for 2,100 yen and contain 300ml.